Store-bought marinara sauce is a wonderful time saver. You can get it in just about any flavor you can imagine: garlic, herbed, parmesan, vodka-infused, mushroom…the list goes on and on. These sauces are usually delicious and offer a lot of flavor, but if you read the label, you’ll likely find things that you probably didn’t expect, such as a TON of added salt and sugar, along with preservatives. We’ve been trying to eliminate excess chemicals from our diet, so I recently decided to start making my own marinara sauce. It doesn’t take that much time and the benefits of knowing what we’re eating are worth the extra work! Want to give it a try yourself? You will need carrots, celery, onion, olive oil, garlic, salt, pepper, wine (white or red), crushed tomatoes, a whole tomato, dried thyme, oregano, sage, parsley, and basil. Like your marinara with a little zing? Grab some crushed red pepper or your favorite hot sauce, too! Start by washing 2 carrots and 2 celery stalks. Peel and chop the carrots. Also coarsely chop the celery and one small onion. 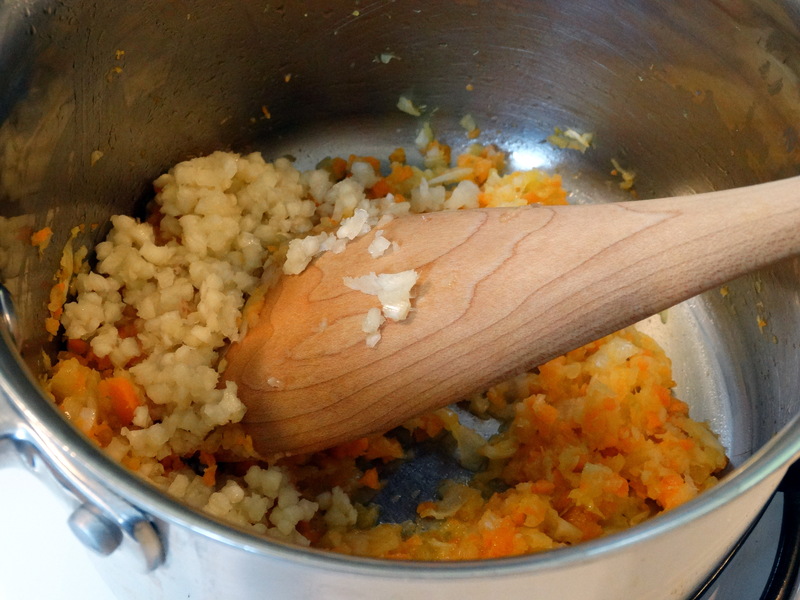 Add the chopped carrot, celery, and onion to a food processor. Pulse until you reach your desired consistency. You can puree it if you like, or leave it a little chunky. This time, I chose to make mine just a little chunky for some texture. Add your veggies, along with a couple tablespoons of olive oil, to a large sauce pan and stir to coat. Heat over medium, stirring occasionally for about 10 minutes. While the veggies are cooking, peel and mince some garlic. As you may recall, I LOVE garlic, so I used 5 cloves, but you can use less (or more!). Add the garlic to your pan and cook for one additional minute. 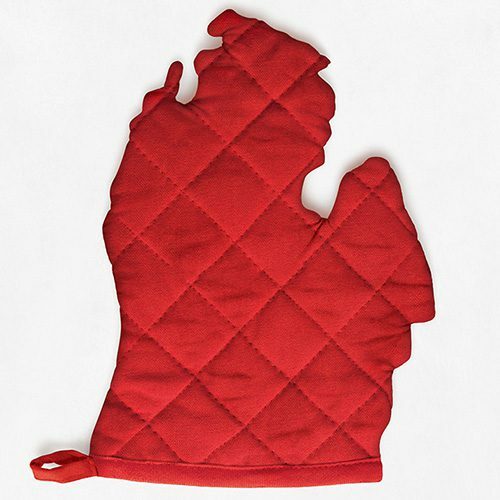 Next, turn up the heat to medium-high and add 2 tablespoons of white or red wine. Bring to a simmer and reduce until most of the liquid is evaporated. Add one 28 ounce can of crushed tomatoes and stir to combine. Fill the empty can almost half way with water, swirling to remove the stuck tomato sauce from the sides, and add it to your pan. Quarter one whole tomato, removing the core and seeds. Coarsely chop and add to your sauce, along with 1/4 teaspoon of salt, 1/4 teaspoon pepper, and 1/2 teaspoon each of dried thyme, oregano, sage, parsley, and basil. If you’re in the mood for a spicy sauce, add some crushed red pepper flakes or a splash (or two… or three!) of your favorite hot sauce. Now comes the easy part! Bring your sauce to a low simmer, partially cover your pan with the lid, allowing steam to escape, and cook for at least two hours, stirring occasionally. This will give your sauce time to reduce and the flavors to infuse. 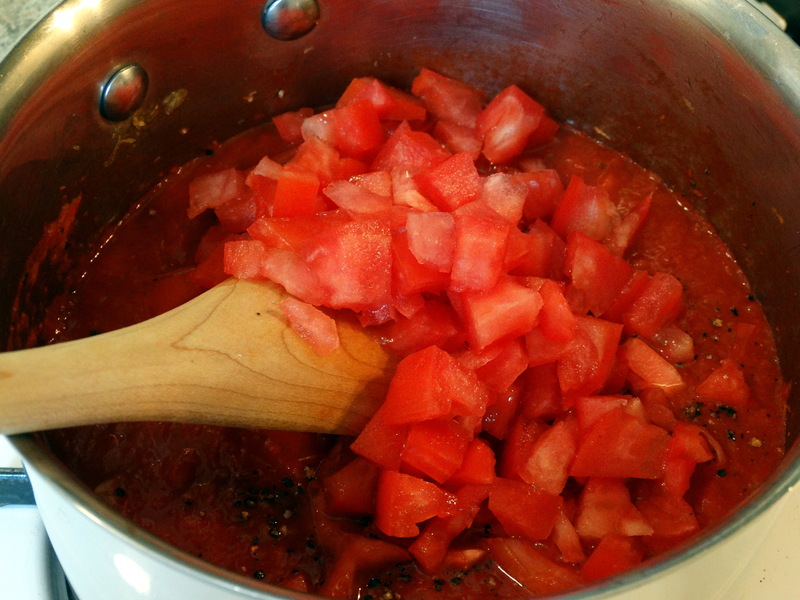 The chopped tomato will break down into the sauce, giving it some additional texture. When your sauce is reduced to your desired thickness, it’s ready to use! Add additional salt, pepper, or herbs to taste. 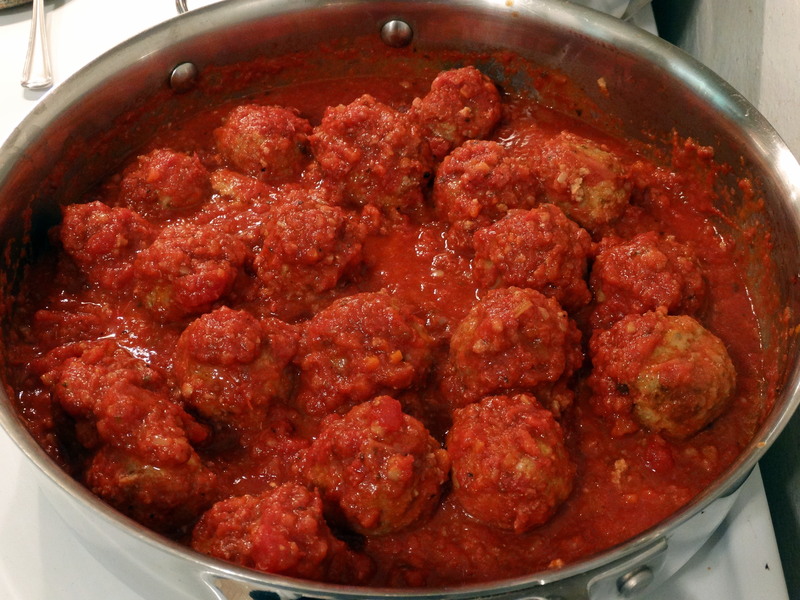 You can use this as a tasty base for spaghetti sauce, lasagna, or perhaps some meatballs, which is what I chose to do with this batch! 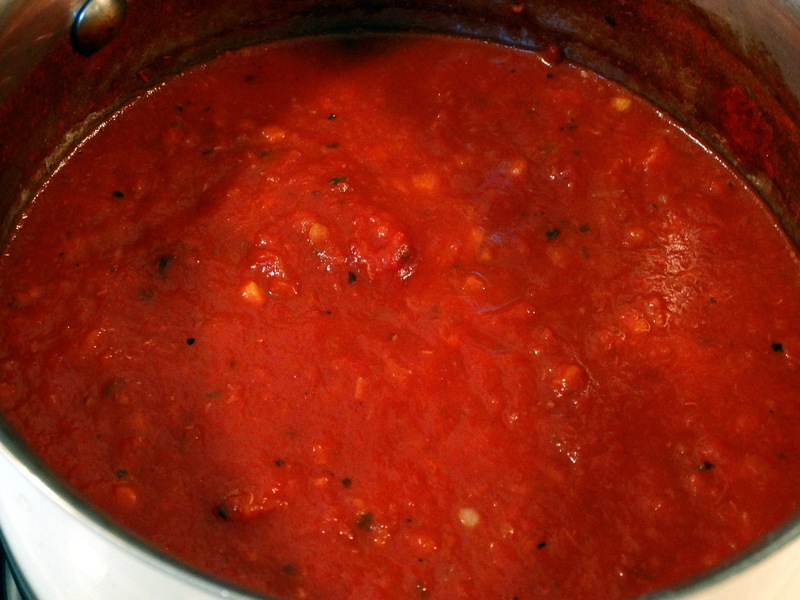 However you decide to use your delicious, homemade marinara…enjoy! If your mouth is watering, you can find my recipe for Linguine with Ricotta Meatballs here! 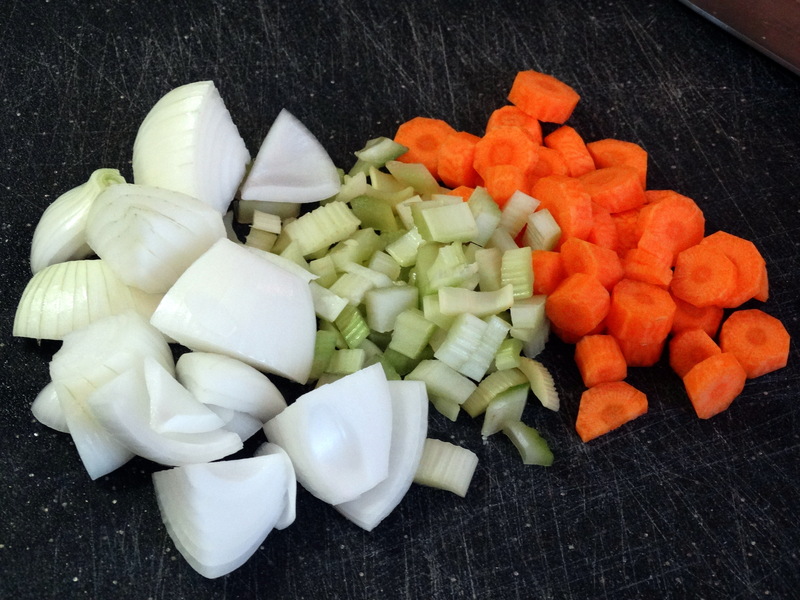 1) Start by washing 2 carrots and 2 celery stalks. Peel and chop the carrots. Also coarsely chop the celery and one small onion. 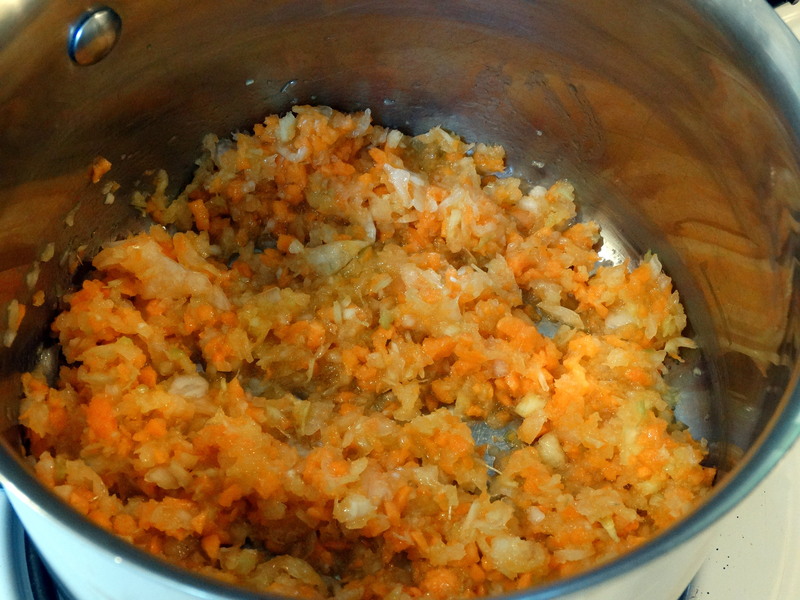 Add the chopped carrot, celery, and onion to a food processor. Pulse until you reach your desired consistency. You can puree it if you like, or leave a little chunky. Add your veggies, along with a couple tablespoons of olive oil, to a large sauce pan and stir to coat. Heat over medium, stirring occasionally for about 10 minutes. While the veggies are cooking, peel and mince some garlic. Add the garlic to your pan and cook for one additional minute. Next, turn up the heat to medium-high and add 2 tablespoons of white or red wine. 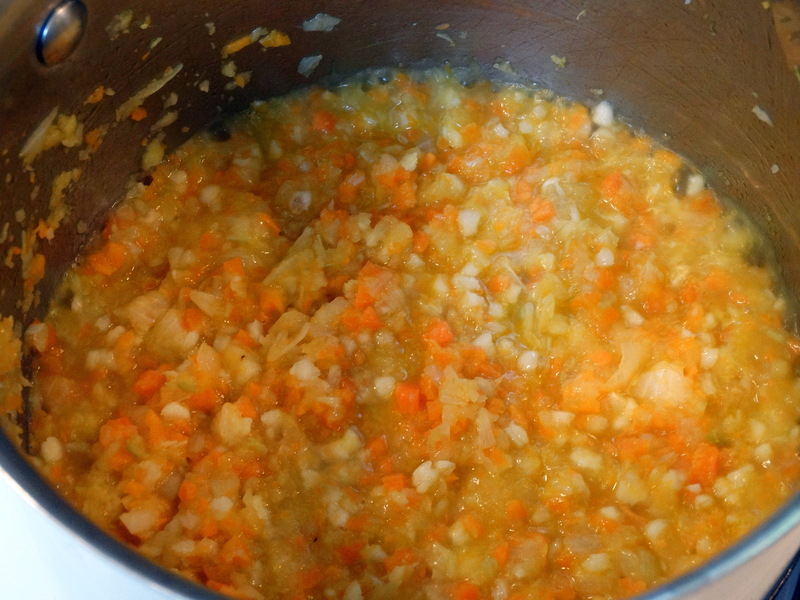 Bring to a simmer and reduce until most of the liquid is evaporated. 2) Add one 28 ounce can of crushed tomatoes and stir to combine. Fill the empty can almost half way with water, swirling to remove the stuck tomato sauce from the sides, and add it to your pan. 3) Quarter one whole tomato, removing the core and seeds. Coarsely chop and add to your sauce, along with 1/4 teaspoon of salt, 1/4 teaspoon pepper, and 1/2 teaspoon each of dried thyme, oregano, sage, parsley, and basil. Add any additional spices you desire as well (such as crushed red pepper or hot sauce). 4) Bring your sauce to a low simmer, partially cover your pan with the lid, allowing steam to escape, and cook for at least two hours, stirring occasionally. Add additional salt, pepper, or herbs to taste. When your sauce is reduced to your desired thickness, it’s ready to use! Enjoy!